I love kir, crème de cassis with white wine, particularly when it’s ‘royale’, that is, with champagne. Crème de cassis is an alcoholic liqueur made from blackcurrants. Put only a little in your white wine, too much and you get a headache. I saw some blackcurrants on sale and thought I’d make my own. First of all I soaked the berries in eau de vie or vodka. I will leave this to macerate for a few months; later I will strain out the berries and add the infused alcohol to a sugar syrup. There are variants on this drink: any fruit syrup mixed with wine: crème de mures (blackberries), crème de peche (peaches), crème de framboise (raspberry). You can also mix it with red wine ‘le communard’ or cider ‘le kir breton’. Traditionally this drink comes from Dijon, in fact it’s named after Felix Kir, a former mayor of Dijon, and drunk with the dry white wine from that area, Aligoté, a burgundy. I like to keep a tiny bottle in my handbag at all times, for travel or ’emergency’ kirs. Dijon is also well known for mustard, which they sell in ceramic jars. Must have a go at making mustard one of these days. I am so going to make this when I find the berries. I have some Blackberries soaking in half a bottle of gin as we speak. Hello, MsMarmitelover. I am wondering why you get a headache if you put too much creme de cassis in your wine. Is it just because of having too much alcohol in general (it can't be any worse than drinking a martini), or the combination of liquor and wine, or is there something else about it that causes headaches? That's interesting: I wanted to make my own Limoncello but discovered that it is impossible to find pure alcohol in London! May I ask which one you use for your cassis? Yum, never tried it in wine, must do! Thanks! Lana: I love trying to make things myself, they generally taste better than shop bought. Liz: I'm not sure why. Obviously everybody likes their kir at different strengths and traditionally I think you put a third creme de cassis to two thirds wine/champagne but to me that seems too sweet. But I have noticed that I get terrible headaches, maybe from mixing liqueur and wine, if I have too strong a kir. Or too many! Which has been known to happen! 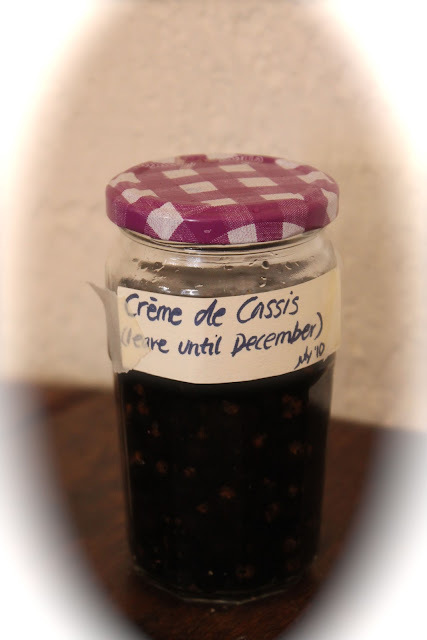 Just remonded me – I was offered some homemade creme de cassis last year in a kir royale – best thing ever tasted. Peaches, blackberries, raspberries…. going to have to try this. Could be an awfully nice bellini. Missed the elderflowers, so will have to be elderberry. Making own limoncello, what a great idea! James: was it? Good to hear. Can't wait to try mine. The person who gave me the recipe hyper-recommended to use pure alcohol, otherwise the infusion might become dangerous or even poisonous. I am sure rectified alcohol is fine, will try soon! How clever, if I can get my hands on blackcurrents will give it a bash. I made Limoncello last year just using straight vodka and it was fine (although way too sweet for me), a third cassis must be incredibly sweet, but a splash is so yummy, and make the bubbles such a pretty colour. Also wish I could find sloes here, I do miss sloe gin……! Oh wow, I'm so excited you can make your own creme de cassis! I visit France a lot and one of my happiest memories is drinking vin blanc cassis and eating Bouchee on the porch. I actually bought a bottle yesterday as I'm doing a gorgeous granita recipe tonight- elderflower sorbet with a drizzle of creme de cassis running through it. Its super pretty. If you wanna play with your homemade cassis, I can send you the recipe? Oh yes that would be lovely Lou! What a simple recipe – brilliant! I'd like to give it a go using brambles – cocktails from the hedgerow – liking it!!!! Ah, to be the sort of woman who carries a little bottle of crème de cassis around with her for emergency kirs! I think I'll have to make some, just so I can carry it around with me and have a kir whenever I fancy. Katie: hedgerow cookery is brilliant! Gin & crumpets: you can buy these tiny little kir bottles in Dijon. As soon as I saw them I thought, phew, problem solved! Please give us the recipe in more detail – if it's possible to do so! I love the thought of having a small bottle in my bag too. Often feel the need for travel or emergency kirs, or just the need to "kir" a glass of otherwise dull white wine in a bar. 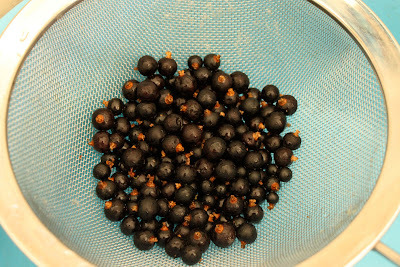 Just got round to making creme de cassis with the blackcurrants that were steeping in vodka since Bastille day 2010! Mashed and strained the fruit, then mixed with a thick sugar syrup and bottled the lot. Going to be patient and let it sit in a dark place, then try it in a month's time.